In 2012, the Consumer Products Safety Commission (CPSC) issued a report warning about high levels of inorganic arsenic in rice and rice products. Rice plants are particularly good at absorbing arsenic from the soil, in particular because they grow in a lot of water. Inorganic arsenic is a common ingredient in pesticides and other products used in farming, and can linger in the soil for a long time after it is used. It can be poisonous. In high doses it is lethal, but even small amounts can damage the brain, nerves, blood vessels, or skin — and increase the risk of birth defects and cancer. Arsenic is an element in the Earth’s crust, and is present in water, air, and soil. It occurs both naturally in the environment and as a result of human activity, including from erosion of arsenic-containing rocks, volcanic eruptions, contamination from mining and smelting ores and previous or current use of arsenic-containing pesticides. There are two general types of arsenic: organic and inorganic (these together are referred to as “total arsenic”). The term “organic” in this context has nothing to do with types of farming; it refers to chemical elements. If arsenic atoms bond with carbon, the compound is organic. If there’s no carbon present, it’s inorganic. Of the two types, the inorganic forms of arsenic have been more closely associated with adverse health effects. How does arsenic get into foods? Arsenic is present in water, air and soil and is absorbed by some food crops as they grow. It is not an additive or ingredient in these food crops and cannot be completely eliminated from food. Rice, a staple of the global diet, is a leading dietary source of inorganic arsenic, both because of how commonly it’s consumed and because as rice plants grow, the plant and grain tend to absorb arsenic more readily than other food crops. Because arsenic is naturally found in the soil and water, it is absorbed by plants regardless of whether they are grown under conventional or organic farming practices. The FDA is unaware of any data that show a difference in the amount of arsenic found in organic rice versus conventionally grown rice. Long-term exposure to high levels of arsenic is associated with higher rates of skin, bladder and lung cancers, as well as heart disease. The FDA is currently examining these and other long-term effects. Does the FDA test for arsenic in foods? The FDA has been testing for total arsenic in food, including rice, through its Total Diet Study program. The agency also monitors the level of arsenic in selected domestic and imported foods under the Toxic Elements in Foods and Foodware program. In 2011, after new methods to differentiate the forms of arsenic became available, the agency expanded its testing to help better understand and manage possible arsenic-related risks associated with food consumption in the United States. 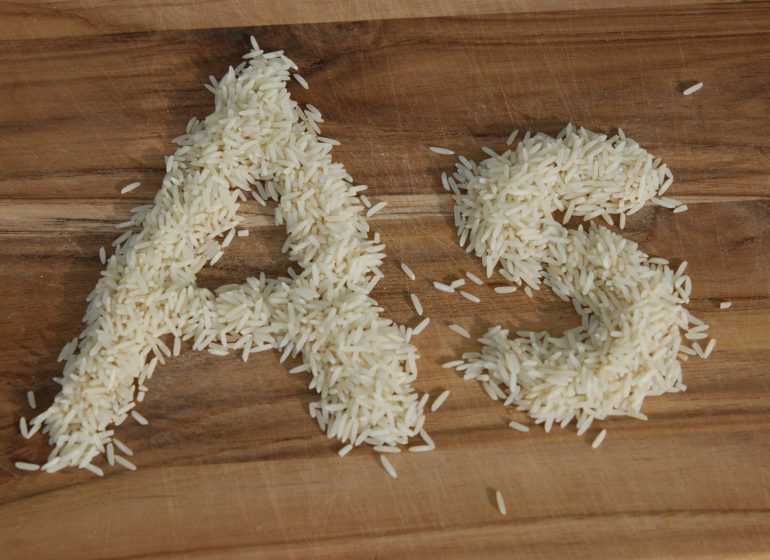 Why did the FDA choose to focus on arsenic in rice? Preliminary data that have now been confirmed indicated that rice had higher levels of inorganic arsenic than other foods, in part because as rice plants grow, the plant and grain tend to absorb arsenic more readily than other food crops. Rice is a staple in the U.S. diet and is widely consumed, including by infants. Additionally, rice intake, primarily through infant rice cereal, is about three times greater for infants than adults in relation to body weight. In 2013, the FDA released a broader set of test data for the levels of inorganic arsenic, which covered most types of rice grain and rice-based foods and beverages eaten in the United States, approximately 1,300 samples of rice and rice products in all. Among the rice/rice product categories in this larger data set, average levels of inorganic arsenic ranged from 1 ppb in infant formula up to 160 ppb in brown rice with other rice-containing products in between. For its evaluation, the FDA considered “rice products” to include foods that contain rice grains (such as breakfast cereals or rice cakes) or rice-derived ingredients (such as rice flour or brown rice syrup). What has the FDA done about arsenic in rice? Based on its testing, the FDA on April 1, 2016 proposed an action level, or limit, of 100 parts per billion (ppb) for inorganic arsenic in infant rice cereal. This level, which is based on the FDA’s assessment of a large body of scientific information, seeks to reduce infant exposure to inorganic arsenic. The FDA found that inorganic arsenic exposure in infants and pregnant women can result in a child’s decreased performance on certain developmental tests that measure learning, based on epidemiological evidence about arsenic, including dietary exposures.